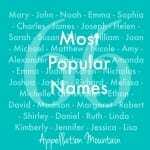 May brings sunshine, flowers … and the new official most popular baby names list! 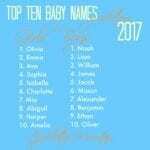 So today I’m predicting the new Top 100 names of 2018. These are already popular picks that haven’t quite cracked the double-digits just yet. But I think we’ll see them when the new list of 2017 data is released in May 2018. Tyler and Brandon seem likely to leave the US Top 100 this year, but what will take their place? I have my eye on these five choices, a mix of evergreen appellations, surname names, and choices with history galore, all set to be more popular in 2018 than the years before. Everett makes a brother for Oliver, or maybe a slightly less popular substitute. It’s a surname, of course, with Old English roots. (The meaning is roughly “brave boar.”) Boys’ names ending with -t have been trending, like Beckett and Elliot, but it seems like Everett is leading the pack. Chalk it up to that stylish letter v, or maybe the vague virtue vibe thanks to “ever” being the first four letters. Or maybe it’s because Everett has been here before. Back in 1918, Everett ranked in the Top 100, so maybe it’s just plain time for a comeback. Read more about Everett here. 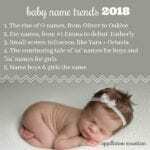 Traditional boy names do trend. Today we’re wild about Henry and William, but cool on Edward and Timothy. One of the more classic picks on the upswing? George. Credit goes to adorable Prince George Alexander Louis of Cambridge. The name stood at #158 the year the pint-sized prince was born. Today, it’s up more than two dozen places. That might not seem like a big leap, but it does mark a definite reversal of course. For decades prior, the name fell in use. Back in 1918, George came in at #6, a regular Top Ten favorite. It might not make it that high again soon, but it seems to be headed back to the Top 100. Longer surname names for boys are trending, with choices like Sullivan and Remington creeping up on long-time favorites like Mason and Parker. Harrison promises to be one of the more popular. It’s a rock star baby name, thanks to the Beatles’ George Harrison. (Hey, did someone say George?!) But it’s also a form of the evergreen Henry, a presidential surname choice, and, of course, the name of Hollywood leading man Harrison Ford. Ford has played some of the most memorable characters of a generation, including Han Solo and Indiana Jones. No surprise that parents today hear it as a first name that mixes an adventurous spirit with a buttoned-down sensibility. I’ve yet to write about Harrison. Check back and I’ll update when I do. Miles works for a great many parents. It has roots – after all, Captain Myles Standish arrived in American aboard the Mayflower. Jazz great Miles Davis lends it a considerable cool factor. And runners might find the reference to distance appealing, too. (Though the name’s meaning has nothing to do with the measurement; it may mean “gracious,” though it’s often linked to the Latin word for soldier.) If you’re after something that feels traditional, without being a true classic, Miles occupies that gray area nicely. As of 2016, Miles ranked #105 – the highest showing ever! And yet, I think this one has farther to go, straight into the Top 100. Read more about Miles here. Silas comes from a contraction of the ancient name Silvanus, from the Latin silva – woods. That ties this name to a Roman god, a New Testament figure, and, of course, Justin Timberlake’s son. The last one gets credit for boosting the name. 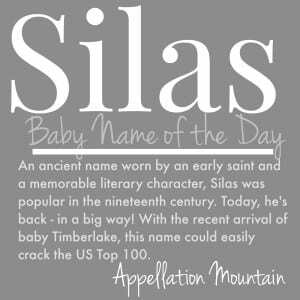 While Silas had climbed steadily, the name plateaued outside of the Top 100. After Timberlake and wife Jessica Biel welcomed son Silas Randall in April 2015, that changed, and now the name is on the rise once more. Read more about Silas here. My dark horse pick? That honor goes to Maverick. Maybe it’s the universe repaying me for all of my snarky comments all those years ago, when I declared it unwearable. 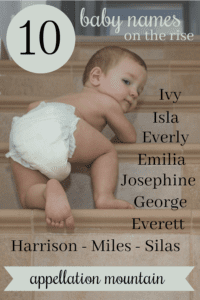 Note to self: trendy names do make the Top 100 – and Top Ten! (Hello, Jayden.) And once a name becomes that broadly familiar? By definition it is wearable, because we just plain get used to hearing it on children. And those children will grow up, and do good things on this Earth, and make those names their own. (I was so, so wrong to dismiss it.) Maverick continues to appeal to parents in greater and greater numbers. While I’m not officially putting it on my list this year, I fully expect it to get to the US Top 100 … soon. Taylor and Brianna seem headed out of the Top 100. Plenty of names are vying to take their place. 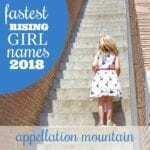 The influences might feel predictable: nature names, liquid names, and a healthy dose of novel surname-name inspired picks all make my list of candidates for the new Top 100. Okay, Emilia sat right outside of the Top 100 last year, so maybe it’s not fair to name it here. But not every variant form catches on. Vivienne has yet to eclipse Vivian, and Aubrie never overtook Aubrey. Emilia promises to be different, and here’s why: first, it picks up on our love of Emma, Emily, and especially, the rising Amelia. Parents who like Amelia, but love the idea of Emmy for short will be drawn to this spelling. And it’s difficult to underestimate the appeal of Emilia Clarke, better known as the Khaleesi of Game of Thrones fame, and about to leap into the space age in Solo: A Star Wars Story. And, of course, Emilia has separate roots, making it more than just a creative spin on Amelia. If Emily and Avery can make the US Top Ten, surely Everly is due for the Top 100 – at least! It’s the sister name to Everett, another Ev- choice that sounds like it’s been around forever, even though this name is thoroughly modern. It’s the twenty-first century update to Evelyn, boosted by a handful of high-profile birth announcements, including Channing Tatum and Jenna Dewan’s daughter, born in 2013. Three-syllable, ends-in-y names for girls have a long history in the US, from Dorothy to Kimberly to Kennedy. Read more about Everly here. Isla might be the standard bearer for liquid names, all flowing vowel sounds. 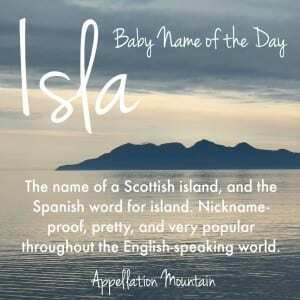 It’s the Spanish word for island – except that sounds like ees LAH, and this one actually comes from the name of a Scottish island, which makes it eye LAH. Scottish-Australian actor Isla Fisher means we all know how to pronounce this one. Since debuting in the US Top 1000 in 2008, it’s climbed steadily, and seems poised for the Top 100. Read more about Isla here. Take Ava’s short, sharp, and stylish sound, then layer in the floral appeal of Lily, and what do you get? This fast-rising nature name. While it has a long history of use, parents long avoided Ivy because of Poison (as in the plant and the Batman nemesis.) Today, it’s more likely to bring to mind the winter holidays and the prestigious Ivy League. As of 2016, it’s more popular than ever before – and might just be ready to debut in the US Top 100. If George is the comeback classic kid on the boys’ side, Josephine plays the same role for the girls. Katherine, Elizabeth, and Eleanor all rank in the current girls’ Top 100. Josephine shares similar characteristics: it’s traditional and nickname-rich. But it also feels just slightly less expected, at least for now. Since I added a dark horse pick for the boys’ list, I’ll do the same with the girls. I’m watching Nova. It shares qualities with Ivy, and we do like those girls’ names ending with a, like Emma and Maya. And the meaning – new – seems irresistible, especially combined with the ties to the night sky. If Luna and Stella appeal, it’s possible that Nova will, too. Still, I’m not sure the name will climb into Top 100 this year … but maybe next? Are you hearing more of these names in your neighborhood? Are there any other names you think are likely to catch on in a big way? So many of these names were on my list in 2008 when we ultimately chose Vincent. Based on the trend lines and 2017 standings, Maverick seems like a long shot for 2018 but a shoo-in for the 2019 top 100. Trends I’m noticing: popularity of Ever- (both sexes) and -lee girls. I think Everlee will crack the top 1000 while Everly will surely enter the Top 100. Just look at Everly’s numbers over the past decade; impressively trendy–you just don’t see a popularity boom like that often. On a related note, I think Everest is a long shot for the 2018 top 1000 but a shoo-in for the 2019 top 1000. Ivy- I’ve met quite a few little Ivys over the past couple years, it’s been popular where we are apparently. I still feel more than a little snarky about Maverick, since the only one I know is dweeby as all get out. Ack, that sounds harsher than its meant to be , and I wasn’t trying to be judgmental. But he’s small and kind of spacey and a bit clumsy, and all of things are absolutely fine, and he absolutely should be who he is, but… Maverick? Maybe he’ll grow into it, but then… he shouldn’t have to, you know? And it’s a great word for what it is, so I’d rather not see the word itself watered down , and eh, I’m feeling rather pendantic today, apparently. We have an Ivy (2015), and although it’s rising on the charts, I have yet to meet another one (younger OR older). It’s one of those supposedly popular names that remains uncommon on the street and seems to still surprise and delight everyone we tell it to. KW, that’s a good point. It’s very possible to have a Top 100, Top 50, even Top TEN name today and not share it. Names are more diverse, and that’s a GOOD thing. And my take on Top 100 names? Most of them climb that high because they’re just plain great names. That absolutely includes Ivy!